Nick Whale Motorhomes is an official Franchise holder for WildAx Motorhomes and we hold the most comprehensive stock of WildAx Motorhomes in the country. Our customer led approach has also seen us grow into one of the largest retailers of WildAx Motorhomes in the country and we are proud to be recognised as a “WildAx Destination Site”. All new WildAx motorhomes have European Whole Vehicle Type Approval - this means that the VCA (Vehicle Certification Agency) has approved their design of motorhomes to be built on the different brands of vehicles they use. In Feb 2014 WildAx Motorhomes asked Truma UK to independantly test all WildAx models for winterisation and insulation AND...They passed at the highest level possible gaining Grade 3 winterisation! This means that their motorhomes have been tested down to -15 deg C- so, they have the highest possible level of insulation and winterisation. The test involves cooling the motorhome to -15 deg overnight then operating the motorhome heater to warm the interior to +20 deg. This must be achieved in under 4 hours. They did it in 3 hours 21 min! At WildAx they have always built their motorhomes in a similar way - solidly! Their methods and machinery have changed over the years but the underlying principle of a well built motorhome remains the same. Their motorhomes are a quiet drive on the road - none of the annoying rattles that are common in motorhomes and caravans. This is achieved by using experienced craftsmen to build the motorhomes and listening to our customers! Many of the design features in our range of motorhomes exist due to feedback from their customers and from their own use of the vans. Every new motorhome has a full 24 hour test prior to collection including a driving test for rattles! An Extensive Stock Holding across the whole WildAx range. Live Link to the WildAx Website. Big News! 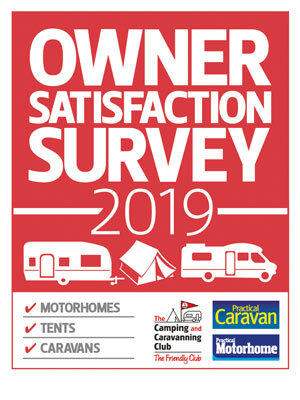 WildAx named as winner of National 2019 Owner Satisfaction Awards.